Potatoes. I love potatoes. In my whole life, I have met one person, a kid, who didn’t like potatoes. Most of us love them. They are at once dense and creamy, rich and starchy, colorful (if you open yourself to new varieties, of which there are hundreds!) and versatile. You can roast them, fry them, bake them, grate them and mash them. You can eat them with eggs or vegetables, rice or bread or all by themselves. And they are reasonably good for you-Okay, that is if you don’t deep fry them or cover them with cream. But nonetheless, they are a great food. Here, in Argentina, and in particular in Mendoza, there is a significant Italian ancestry. It is noticeable in the abundance of ‘fiambre’ or cured meats, pizza, and especially the pasta. In almost any little restaurant or deli, you can find your choice of canneloni, ravioli, spaghetti, and gnocchi. In my mind, gnocchi are the ideal food. Not only are they pasta, dough that tastes great with most anything and satisfies most everyone; but they are that dough made with potatoes! In my investigations for information on gnocchi in Argentina, I learned that Argentina actually has a national gnocchi day! Not once a year, but once a month! These folks really do love their little nuggets. I used a basic recipe and adapted it slightly by using half whole wheat flour. This changes the consistency somewhat, but I prefer a bit more texture in my pasta. The most important thing seems to be to get a good dough consistency. You don’t want your gnocchi to be so soft that they will droop or fall apart, but you also don’t want them to be so firm that they are hard. As with pasta or bread dough, you are aiming for a moist, yet firm texture. Something you can roll out without sticking. In addition to the traditional potato gnocchi, I also made a squash and polenta version which may have been even more delicious. Gnocchi are delicious with most any sauce, simple butter, a cream sauce, pesto or a traditional red sauce. 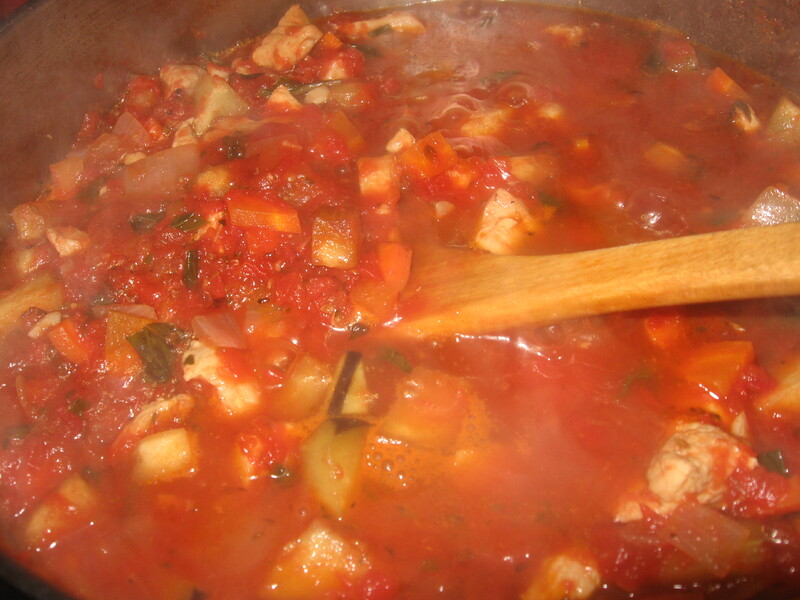 In this case I prepared a red sauce, which included diced chicken, eggplant and fresh basil. Rico! 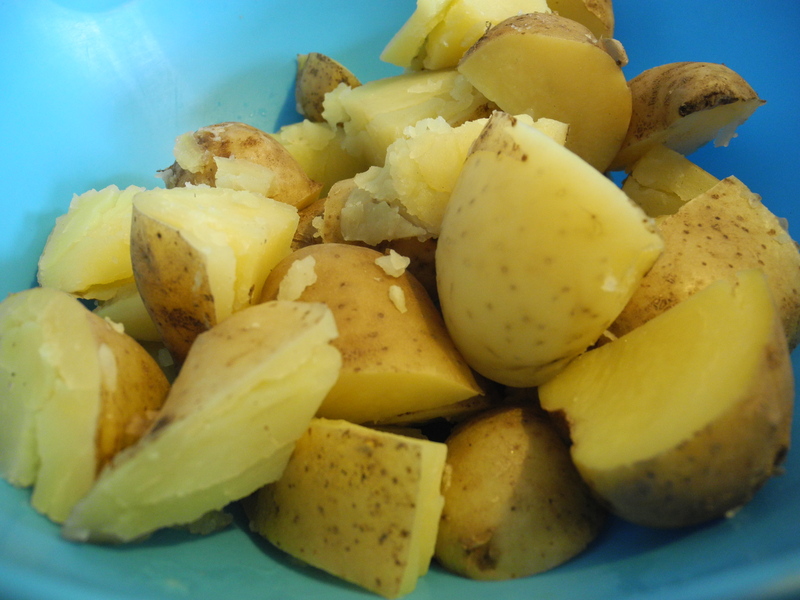 2 # potatoes-about 3 medium (yellow finn work very well) If using squash, use half potatoes and half squash. 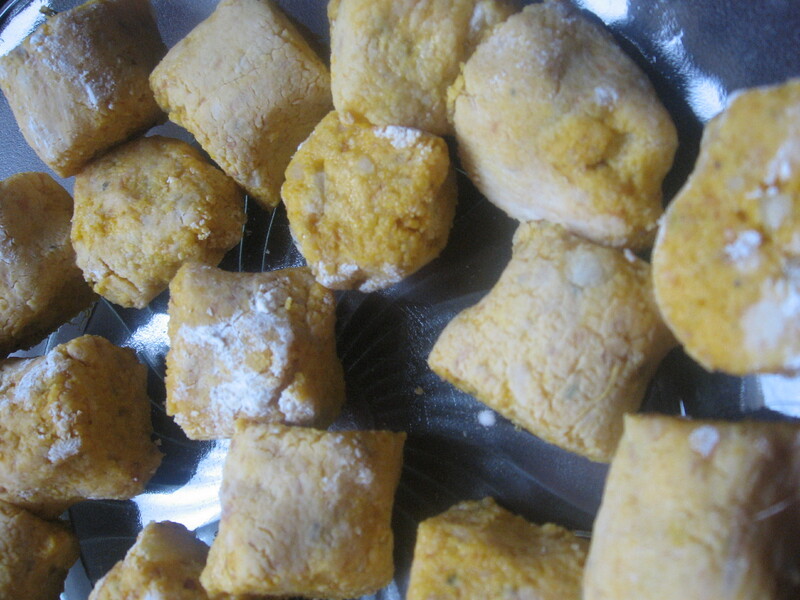 1 cup four (I used 1/2 whole wheat and 1/2 white) If using polenta or cornmeal, use half and half. Dice and boil potatoes until very soft. When cool, remove skins and mash. Some recipes suggest using a ricer, but I like the rustic texture of mashing by hand. 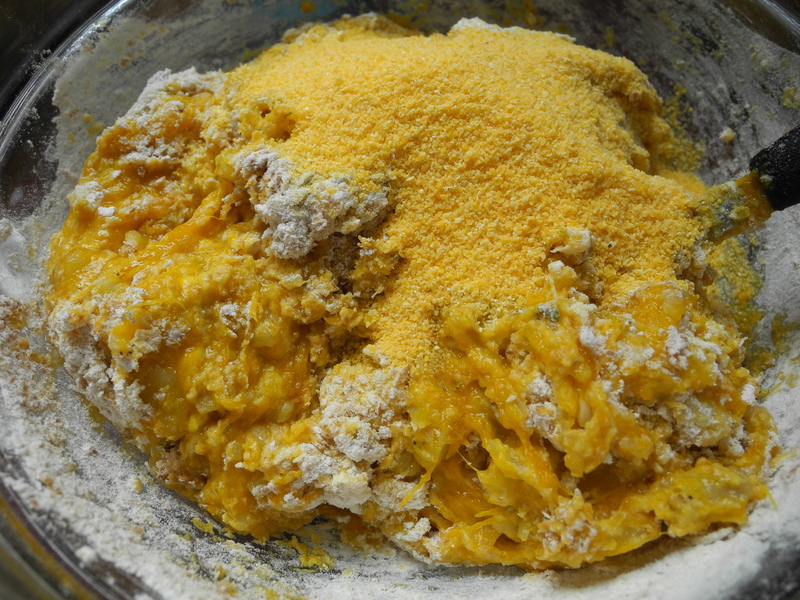 For squash, either peel, dice and boil until soft, or bake until soft and scoop out the flesh. I also added cinnamon, and thyme to the squash version. Combine the egg with potatoes and mix well. 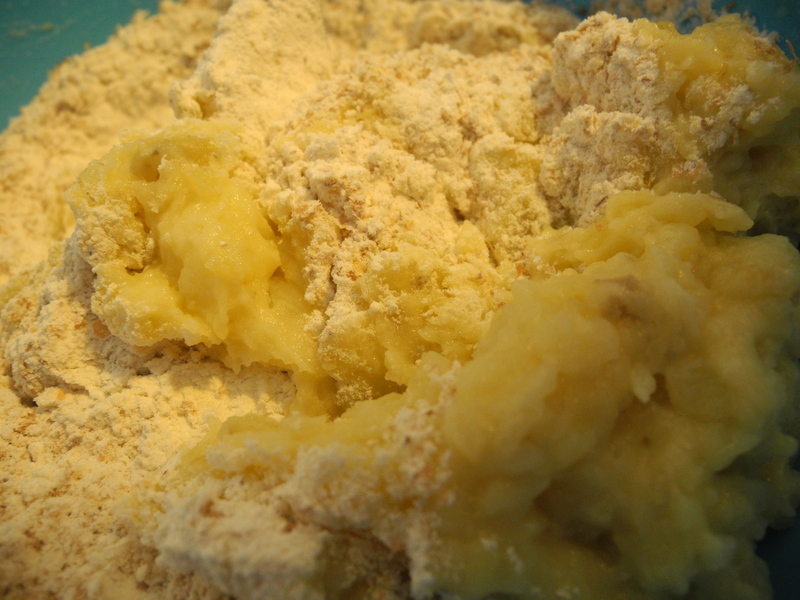 Then add flour and salt and mix until it becomes a doughy texture. You may need to add more flour if the dough is very moist. 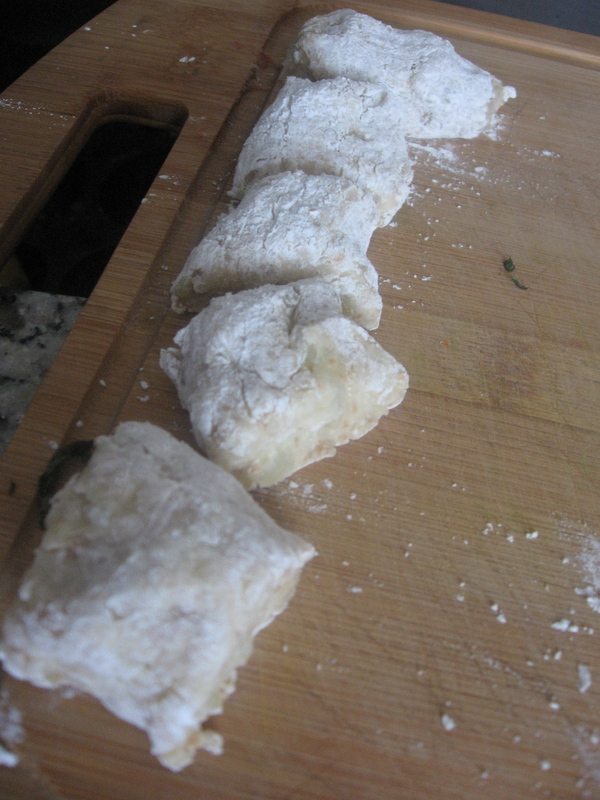 When the dough is firm enough, roll out on a floured surface into thin logs and cut into pieces about 1 inch long. You can roll each of these into ovals, decorate with a fork or simply leave as they are. If you will be using them in a sauce or stew (as I did), their appearance will be less noticeable. When the gnocchi are ready, prepare them like regular pasta, but they should only boil for about 2-3 minutes as they are very fresh and soft. If using in a sauce or stew, add them just before serving, as you would a dumpling.